Fantasy and historical fiction and myth here run together with the Matter of Britain, in a novel that’s easy to admire, to respect and to enjoy, but difficult to love. Still, “The Buried Giant” does what important books do: It remains in the mind long after it has been read, refusing to leave, forcing one to turn it over and over. On a second reading, and on a third, its characters and events and motives are easier to understand, but even so, it guards its secrets and its world close. There are authors who write in tidy, classifiable, immediately recognizable genres — Jane Austen, Alexandre Dumas, William Faulkner, Gabriel García Márquez, to name a few — and then there are those who adamantly do not. These others can surprise us with story lines and settings that are guises to be worn and shucked after the telling. Masters of reinvention, they slip from era to era, land to land, changing idioms, adapting styles, heedless of labels. They are creatures of a nonsectarian world, comfortable in many skins, channelers of languages. What interests them above all in their invented universes is the abiding human heart. Kazuo Ishiguro is such a writer. Axl and Beatrice are an elderly couple, who decide to cross the country, to visit their son. They have not seen him in many years. It is the Dark Ages, sometime after King Arthur's reign. The Britons and Saxons are not at war but the mood remains tense and unstable. There are many dangers along the way, making this a dark and perilous journey. The couple team up with an aged Knight, appointed by Arthur, who assists them along the way. This is an interesting tale, combining history with fantasy. It is deliberately paced and deceptively simple in structure. The themes here, hover under the surface but it is a story about the power of memory and the value of forgetfulness. What we repress and what we cherish. I think this is one of the more over-hyped books I've read in quite awhile. But they set out on their journey - or quest - anyway, and as with any decent quest, they meet on the way a range of characters who help, hinder and harm them in their travails. And as they journey, dark corners of their memory are illuminated and the truth of their past, the truth of Arthur's peace and the reasons for the epidemic of forgetfulness are revealed and the nature of the buried giant (its not what you think) is uncovered. I find it difficult to praise this book too highly. The confrontation scene between Wistan the Saxon and Sir Gawain, in particular, is a classic of modern literature. Readers of The Remains of The Day or Never Let Me Go will recognise the restrained, understated style, occasionally letting small fragments of crucial information slip (you have to pay attention to Ishiguro). But its a better book than either. It really is. And the closing chapter is devastating. A very beautiful, very sad book. This is some of the most precise writing in the English language - it never felt as if even one word was out of place. I am definitely a fan of his writing; while it's been some time since I read his previous works, I think this may be his best. OK, but not as good as I hoped. This is the sixth of Ishiguro's novels that I've read, and my expectations were set very high. My expectations were also just very different from what I got - this is a radical departure from previous books. Here, Ishiguro plays with elements of Anglo-Saxon history and British culture. 'Beowulf' meets Arthurian legend in a strange, mythic fantasy. Axl and Beatrice are a devoted elderly couple in a primitive rural community. At first, the reader thinks that their confusion and issues with recalling details are a result of naturally-failing faculties, but soon it becomes clear that it's not just the two old people - the entire land is under some kind of plague of forgetfulness. The couple keep having a vague feeling that they ought to go see their son, in a neighboring village. Eventually, they motivate themselves to pack up and go, hoping that the way will come to them as they travel. Along with them goes a bold Saxon warrior. He has lately rescued a local child from being kidnapped by monsters, but rather than showing gratitude for this heroic act, the villagers are suspicious that the child has been infected with some supernatural evil, due to a bite wound on his body. When he leaves, the warrior is asked to take the child with him, and the two join the old couple. Along the way, they encounter a knight (names might be shared, but not the particulars, with characters from the Round Table), and in addition to Axl and Beatrice's quest to find their son, a quest to find (and, perhaps, slay) a dragon is added. The boatman worked. Very well. The references to Charon and Avalon fit, and the thread weaves effectively throughout the novel, further hints being slowly added until the final scene. That part was done beautifully. However, too many of the other elements felt... just kinda squished in there. "Well, this is an Important Symbol, so if I add it in and then write about it as if it is Highly Significant, my book will feel Very Meaningful." A lot of the book felt like an allegory... but an allegory of what? It felt Symbolist - but what are the 'truths' to be revealed? At the end of the book, the conclusion left me with a tear in my eye - but I simultaneously felt frustrated and dissatisfied. Two elderly Britons, the chivalrous Axl and his wife Beatrice, undertake a journey to a neighbouring village to see their son. Why doesn’t he live in their village? Why did he leave? They can’t remember. It’s as though the mist which enshrouds their land also obscures their memories. Yet they hold to their conviction that their son eagerly awaits them, wherever he might be. Their journey, which might better be described as a quest, sees them meet unexpected friends and foes and forces them to partake of adventures they had not planned but which become essential. And everything, in the end, has something to do with the mist and whether it is a force of good or ill.
Ishiguro has a special fondness for the theme of forgetfulness, especially as it relates to personal and political identity. His early novels examined this issue from the perspective of an individual corruption of memory/history. Here he broadens his canvas to a collective forgetting, a necessary forgetting (possibly). The land is steeped in blood, in the horrors of war, and in the atrocities that are committed even by those whose aim is just. How can there be peace in such a land if the victims remember the harms that have been done to them? Without forgetfulness is there any hope at all for peace? Or is the peace that passeth understanding all that we can hope for? Where I got the book: Audiobook purchased on Audible. I never approach a Kazuo Ishiguro novel without expecting to feel ever so slightly flat when I finish it, but I read them anyway. The man is a true artist in the way Turner is a true artist—yes, his work is recognizably a story in the way Turner’s greatest works are recognizably a painting of something, and is underpinned by structure and a huge amount of intelligence, but it can be bloody hard work to discern your reference points. This, I guess, is literary genius, but it’s hard to recognize sometimes as a novel. The apparently meandering story eventually resolves itself into a quest, or perhaps several quests. It’s as if the other characters are partly there to herd Axl and Beatrice toward their role in witnessing a pivotal change in the memory landscape that will have untold consequences for their own people, and considerable personal implications. The novel ends with a moment of hope followed by bleakness, which is just as well, because if Ishiguro gave up his bleakness he wouldn’t be Ishiguro. What I think I’m getting from this allegory is that for a society, forgetting or remembering is a conscious decision, and not one that can be made lightly. Choosing to forget past injuries can bring about a more peaceful world, but not one that’s necessarily helpful for its inhabitants, and it’s at best a temporary peace, a sleeping monster that can be awakened. On a personal level the choice is less clear and the consequences more immediate—our memories are both joyful and sad, and that’s what we have to live with. Ishiguro is certainly also saying something about old age, as many of the characters are elderly, and in fact the land of the Britons is in its dotage, with the glories of King Arthur a fading memory. The lifting of the forgetful peace will bring tragedy, but ultimately renewal. The Buried Giant sort of snuck up on me really. Several rainy days on a holiday led me to the warm embrace of a fine second-hand bookshop. I saw The Buried Giant, amongst a few other gems, and added it to my pile. 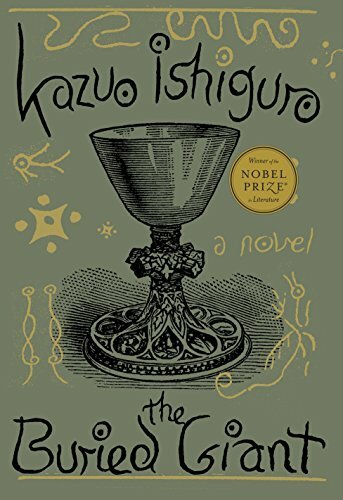 Vaguely I remembered reading Ishiguro some other time: a check when I returned to my computer and had access to LibraryThing informed me that I had read When We Were Orphans, but rated it as somewhat mediocre, and certainly it left no impression on me after seven years. I simply could not recall reading it. The rain eased up, and The Buried Giant slipped my mind. Until some down time a few months later. So I reached for it, and it would not let me go. In fact it worked its own strange spell, as strange as that of the breath of she-dragon Querig, compelling and rewarding this reader yet without cause to have done so. The characters trudge along, make their way towards various self-discoveries that emerge from a mystical mist of amnesia, and leave me. And that’s it, really. I think the goat survives. Or does it? Does anyone? The sixth century is a strange lull in the history of the British Isles. At least according to the narrative Arthur’s peace has held, but can peace ever hold where xenophobia and perceived injustice lurk? Saxons loiter with intent, and only amnesia holds them at bay. Pilgrims meander, though amnesia tends to make them wonder why, whither and whence from time to time. Recollections of a life once lived form, and then prove to be chimeric, slipping away. Bad things, good things … things just happen. Amnesia is redemptive. Or does it condemn? One or the other. Amnesia makes it hard to know, really, for the coordinates, the reference points are lost, and why were we loving and hating and fighting and walking anyway? I was excited to see this novel. I'd finally read Never Let Me Go last year and liked Ishiguro so much that I'm exploring his backlist (up next: An Artist of the Floating World). But details about this new novel were vague; all I knew going in was its post-Arthurian English setting, which appealed to me. And, indeed, the very first paragraph plunged me into the Middle Ages and the story of an older couple who, on the margins (physically and emotionally) of a village in decline, embark on a personal quest. I was intrigued enough for the first hundred pages as Ishiguro explored Saxons and Britons and slowly dropped clues that seemed to develop an allegory on aging. Then suddenly it genre-jumped to full-on fantasy, including dangerous forests, ogres, pixies and a dragon. Honestly, I kept envisioning ... Shrek! I realize I strongly prefer realistic fiction, but I'd expected Ishiguro's writing to keep me engaged. Instead, I never connected with a character (except maybe the unnamed narrator...); I didn't highlight even one passage in the book; there was repetition that became tedious. For all the brouhaha about a literary writer doing a genre book, after reading The Buried Giant, I've realized that Kazuo Ishiguro is really using all the Arthurian fantasy tropes as a stylist rather than as a narrative focus. So he's not really writing fantasy nor is he engaging with the genre in any critical or confrontational way. Never mind all the ogres and pixies and the dragon. It's just a means to an end. Neither a bad thing nor a good thing but an example of how the media really wanted to use this book as a kind of battle cry for a new front in some new literary/culture war. Distilled to its bones, The Buried Giant is really just a love story. Not the usual kind but one that focuses on old age and the idea of being in a marriage or partnership with your soul mate over the long run, basically playing with the idea of until-death-do-us-part. It's pretty clear that Beatrice is sick and dying early on, and that the boatman they meet at the start and end of their journey is some kind stand-in for death (Ishiguro uses a blunt hand with his symbols and allusions, so watch out for that; it can feel a little condescending). So you can pretty much guess what happens in that final scene when the elderly couple, Axl and Beatrice, take the voyage to the island. What's telling in that scene is that Beatrice makes that journey with the boatman without Axl at her side. She's alone. In fact, Axl just walks away in the other direction, and it all seems confusing especially since he's been so doting and devoted throughout (the pair was inseparable). Basically, this is Ishiguro drawing attention to that single immutable universal truth: We all die. A possible corollary: We all die alone. According to Ishiguro, It doesn't matter if you've weathered a lifetime together with someone, that final voyage into the light (or into oblivion) is going to be a solo trip. Aside from the love story dimension, The Buried Giant is also squarely about memory and history, both individual and collective. There is a mysterious mist that has robbed people of their memories. It's not total amnesia but a kind erosion of unpleasant memories, very much in the vein of 'Eternal Sunshine for the Spotless Mind.' The journey that Axl and Beatrice go on eventually turns into a mission to help rid the land of that mist, to recover the past, and to remember. Ishiguro's point seems to be that there's a cost to that. Peace throughout the land and relative social harmony between Britons and Saxons seems to depend on that mist blunting the pain and horror of past violence and war. Bitterness and vengeance and cycles of war and sectarian violence are, after all, consequences of never forgetting. Memory and history can be its own tyranny. Maybe the truth won't set you free. Living in Wales, I’ve become obsessively fond of the ancient Welsh myths set out in The Mabinogion. Through the centuries since those stories were first written down, their wonderfully enigmatic themes have been borrowed time and again to help create other imaginative works. When I first began to read The Buried Giant, by my favourite author, Kazuo Ishiguro, I was fiercely reminded of the story in Part Three of The Mabinogion. Two heros, returning to their women from a long and bloody war, find the landscape of their homeland altered. These four central characters wander this enchanted version of Britain until two of them are tempted into an enchanted castle and find themselves struck dumb and unable to move when they touch a golden blow beside a fountain. One of the major themes and motifs of The Buried Giant is a mysterious mist, and I wondered immediately if Ishiguro had been influenced by ‘the mab’. He wouldn’t have been alone; it is likely that E. E. Nesbit was. In her book The Enchanted Castle, she creates a castle with living statues. Half a century later, in The Lion the Witch and the Wardrobe, Jadis, the White Witch, fills her castle with statues of Narnians she has turned to stone. Was C.S. Lewis influenced by Nesbit, or The Mabinogion itself? Using myth to present ideas to today’s readers is not an uncommon one; we are all bound up, whether we know it or not, by the stories that define us, the archetypes that form our understanding of how the world works. With this already in my mind, I couldn’t help wonder if Ishiguro likewise had been likewise influenced. Just as in ‘the mab’, a deep theme of The Buried Giant is symbolized by a mist which has covered Britain and is making the inhabitants forgetful. The people are under an enchantment…and the book itself seems enchanted, for this spellbinding story is an allegory set out as a quest…a quest for a dragon, for family, and for memory itself. Several decades after the death of King Arthur, the original Britons are sharing their land with Saxons who are threatening to take over. An elderly British couple, Axl and Beatrice, set off to find their son, journeying through a landscape infested by ogres and pixies, and a dragon, Querig, who, it is said, is polluting the country with its breath, causing the mist which has resulted in an epidemic of amnesia. Axl and Beatrice want their memories back, but are fearful. Little glimpses into the past suggest things were different when they were young. Axl and Beatrice encounter two warriors, a Saxon called Master Wistan, and the aged Sir Gawain, who both declare they are on a quest to slay Querig. They also take up with a young boy who has been inflicted with a strange bite. Their travel leads them into haphazard and troublesome misadventures, each revealing the human condition and the mysteries of life. One of my favourite moments in the book happens when Axle and Beatrice are sheltering from the rain. They watch an old woman slaughter rabbits to torture the sensitivities of a boatman. The old woman tells them she knows the man; he promised to ferry her and her husband to an island where they would both live. The boatman deceived her, saying he could only manage one passenger at a time. He carried her husband to the island, but never returned for her. Hearing this story, Beatrice becomes anxious that she might be separated from Axl. Again, I was reminded of The Mabinogion, and of the early Irish myths, in which islands, especially islands surrounded by mist, usually represent the otherworld, or the next world. This ‘story in a story’ affected me on a deep, almost subconscious level, and I became as desperate as Beatrice that she should not be left behind. As I read deeply into the book, I could see it set up as many questions as it was answering. Are the supernatural creatures real, or just in the minds of the characters? What is it that Axl and Beatrice have forgotten? Who was Axl when he was young? Why does Beatrice not always trust him? Are the two warriors being truthful about their quests? What will happen if the dragon is slain? And, most importantly…what or who is the Buried Giant? Ishiguro deftly exposes human nature with its weaknesses and strengths through his lyrical and emotive prose. His format is that of allegory, rather than the straightforward historical or fantasy novel, for as the messages are slowly revealed, and the characters face the effects of memory loss and the challenges of their journeys, I found myself examining this in the light of today’s world. The characters show pride, deception, lack of trust, disloyalty and disrespect. They constantly face danger, abandomnent, loss, illness and death, but also find awakening love, compassion and courage. People have found this book mysterious, provocative and uncomfortably. It is unlike other modern novels, but I think Ishiguro means for it to be unique. He means for us to be challenged – to stop and puzzle the story out. The fact that all his other books are equally distinctive is one of the major reasons I love his work; he is without comparison, in my opinion. The Buried Giant echoes the strange dream logic of the Mabinogion, where the tales are tangled and broken and yet weave a passionate magic; I recently spent an entire weekend at a symposium on ‘the mab’. It would not have surprised me to learn that Ishiguro might use Welsh myths in this way, as he loves to take difficult themes and try to make some sense of them. In this book, the early confusions finally resolve into significance, but like myths themselves some extremely profound speculations cannot ever be perfectly clear. So was this book influenced by ‘the mab’? His answer is revealed in an interview with Guernica magazine, where Ishiguro discloses that he was, in fact drawn to the 14th Century Authurian legend, Sir Gawain and the Green Knight – and even then, the major impact was that of setting – something I love to use myself. An entire novel can grow out of its setting, if a writer becomes immersed in it. In the beginning, this is a simple and quiet book, building layers upon mysteries and absent emotions as it begins. For Ishiguro fans, it will be both familiar and strange--there's that beauty of language, that simplicity of emotion, and that twist of character...but the interior is oddly apart. Of course, there's reason for it. Like a legend or the journey of a knight, this is a wandering tale. There's battle and heartbreak, legend and myth, hope and deceit. In the beginning, it is somewhat slow-going. In the last portion, it is impossible to ignore, impossible to walk away from, impossible to forget. Truth be told, a bit into this book, I was wondering whether Ishiguro had lost his touch, or done something so apart from past works (and so apart from my usual tastes) that I simply couldn't get foothold enough to be drawn in. Or perhaps I just wasn't in the mood? And then, there was a turn. Without realizing it, I reached a moment when the characters were more real than friends and loved ones, and when the book felt more real than all the tales of Arthur and his knights which I've heard and read and re-read so often. There reached a point when I couldn't walk away, and now I'm a bit heartbroken for the world and the characters, a bit entranced, and wondering. I'm hating Ishiguro for what he mastered and created, and at the same time believing it to be perfect. Disappointing. Flat characters. Ishiguro trying to break into fantasy. Not for me. The story is set in an early medieval period in England. The Romans are long gone and there are already Saxon settlements scattered around, though the principal characters (Axl and Beatrice) are Britons, living in a labyrinthine warren of caves. Axl and Beatrice are the oldest members of their community and there are frequent early references to the teasing they suffer from the children in their settlement. They also seem to have only intermittent memory. They both have a dim recollection that their son has left their community and set up home elsewhere (they are not sure where). Indeed, the whole of their community seems to have a shared amnesia. Axl can recall a red-haired woman who went among them all a few weeks earlier, offering gnomic advice to all and sundry. His neighbours, however, have no recollection of her at all. “The Buried Giant” doesn’t tell its story simply. On the face of it, it’s a simple tale. An elderly Briton couple- Axl and Beatrice- not valued by their little ‘village’, decide to pay their son a visit in the village nearby where he lives. On the way they meet a Saxon warrior and his injured charge, a knight, ogres, a swarm of nasty pixies, monks with deadly intent, boatmen who ask an awful lot of questions before ferrying his charges across to islands, and more. Many of these characters are not who they seem to be at first. The knight is Sir Gawain, despite King Arthur being long gone. The boatmen, despite working a real river, are the ferrymen of the dead. Even Axl isn’t the peasant he appears to be. Axl and Beatrice are in love with and devoted to each other. Beatrice addresses Axl as ‘husband’ and he calls her “princess” – I’m afraid to say that I did laugh a bit at this, being put in mind of ‘The Princess Bride’. They never want to be more than a couple of steps apart. An odd mist lies over the land; it brings forgetfulness, both of recent events and those long past. It lies in patches, so that sometimes Axl and Beatrice can remember things they previously couldn’t. This leads them to wonder: if there were bad things in their past, would they be better off forgetting them? No, they decide. Those events made them who they are today. But while remembering is good for Axl and Beatrice, it isn’t best for everyone. Sometimes it’s best to let the past be shrouded in forgetfulness for the sake of happiness and peace. Axl and Beatrice can forgive- have forgiven- their past errors; that’s a lot harder for large groups of people. Throughout his notable career, Kazuo Ishiguro has devoted much of his fiction to exploring the power and elusiveness of human memory. In particular, the author has given much consideration to individuals from different walks of life gradually remembering significant events from their past as a means for understanding their present circumstances. For instance, a retired English butler (The Remains of the Day) and an aging Japanese painter (An Artist of the Floating World) both come to grips with how the ill-advised alliances they made during the war have adversely impacted the fortunes of themselves and those they love most. Or, a young woman (Never Let Me Go) recalls the friendships she developed during her boarding school days even as she learns what the true purpose of that school actually was. Now, in The Buried Giant, Ishiguro expands this motivating theme to analyze how groups of people—either married couples or entire societies—pursue the quest to recover their collective memories. Written in the fantasy genre, the novel focuses on Beatrice and Axl, an elderly Briton couple living in the bleak countryside during the years following the fall of King Arthur’s reign. A pervasive mist covers the land, which has robbed all citizens of their power to recall much of their pasts. The husband and wife set off on a journey to find the son they can barely remember, but soon become involved—along with a Saxon warrior and an ancient Arthurian knight—in an epic quest to slay the she-dragon Querig, whose breath is thought to be spreading the miasma of forgetfulness. Somehow I came up with a three star rating, but maybe it should really be a two? Many readers, like me, preordered THE BURIED GIANT on the basis of Kazuo Ishiguro's previous books and his reputation as one of our greatest living authors. Therefore, it sure is difficult to rate the book honestly. Because, honestly, THE BURIED GIANT disappoints. That's an understatement. What was Ishiguro doing? Obviously, this tells the story of an old man and his wife traveling (walking) to where their son is (anxiously awaiting them, they are sure) in post-King-Arthur England. Most reviews call this a fantasy, probably because of the dragon and sprites in the story. Actually, though, as James Wood says in THE NEW YORKER, this story is an allegory. Here's what I think Ishiguro was doing. I think he was experimenting. I also think this experimentation failed. Some readers may give THE BURIED GIANT a high rating.I think that's because it is so difficult to be negative about Ishiguro. He's a brilliant author, so if I dislike his book, the fault must be mine, they think. Right? Not at all the story I was expecting from the blurb. The blend of history, legend, myth, fantasy made this book a frustrating read for me. I don't mind any of those elements when I'm expecting them but this book defied expectations in not always pleasant ways. Having said that I would recommend this book for book clubs as there is a great deal to discuss: the themes, narrative style, use of mythology and so much more. Even though I really didn't like it I want someone I know to read it so I can talk about it. The one point I found very jarring was the beginning of chapter 3 "...a tall fence of tethered timber poles, their points sharpened like giant pencils,.." this is the only point in the descriptions Ishiguro references something so clearly modern and it stuck in my brain like a splinter. A really annoying splinter. The other thing I was confused about was initially I thought this story was about a journey through ancient Britain and set in reality (concluded from blurb)so when things like orgres and dragons were mentioned at first I thought the characters were responding to an unknown threat by making up a mystery beast to explain things they didn't understand. If you've read at least two Ishiguro novels, you probably have picked up on how similar they are in tone and theme, yet how different they are in regards to story. They're such quiet stories, yet there's something which lies beneath that keeps a reader not simply engaged, but excited. There are themes of acceptance, memory, and identity. And it all builds slowly until that moment when the hammer drops, shattering the reader's expectations. Not surprising, The Buried Giant largely follows the same pattern. This time, Ishiguro takes a tour through the world of fantasy. He transports us back to 6th century Britain, in the years following King Arthur's larger-than-life reign. While the focus of the story rests on an old couple making the journey to visit their son, the novel doesn't forget the dragons, pixies, and sword fights of Arthurian lore. As anyone who has read Ishiguro might expect, the author does a masterful job of emulating the speech patterns and concerns of the era, without letting the story get bogged down by these details. When I finished reading The Buried Giant, I didn't feel much satisfaction. As always, Ishiguro surprises us as he moves from genre to genre with no regard for his reader's expectations. Whenever he writes a back I think "Oh, I like him, I'll read that" but then after I read one of his books, I am initially disappointed because it was so unlike his last, but on reflection I find that I loved the current title for entirely different reasons. So it was with The Buried Giant. The tone and feeling of the story, at the very beginning, are unfamiliar and unusual. I kept waiting to understand what was happening and why, but indeed it continues to the end. Kazuo weaves a tale of Arthurian legend, with dragons, ogres, strange mists, knights, quests, and prophecies. He takes these mythical elements and crafts a story of a couple, Beatrice and Axl, on a journey to find their son, who they have almost completely forgotten about, due to a strange mist which robs the land's inhabitants of their memories. Ishiguro introduces the idea that myths were borne of a need to not only understand the natural world and our place within it, but also as a way of dealing with the atrocities of war and the pain of death. In Iron Age England, an older couple named Axl and Beatrice prepare to leave on a trip to visit their son. But in a land covered in a mist that steals everyone's memories such a simple journey becomes far more complex. As Axl and Beatrice travel, they encounter several others on their own quests that will significantly alter their plans and stretch the bonds of their lengthy relationship.